Well I was doing some more maintenance to my Tb today. Had done the thermostat yesterday and remembered that the transfer case was approaching that 80,000km since last service. Last time I had used AT2 fluid from the dealer. I think that was in and around 2012/13 and the fluid came to about 16$ for 2 liters. It was not expensive by any stretch. I had the Tb on ramps and pulled the fill plug first, which came easy as I used some Teflon tape on it. Well it drained out more than expected due to the slope. The old fluid was dark but still blue in the light. In went about 2 liters of some left over ATF I had, Co-op ATF SL, which I had used in my old 1500 as it is a multi fluid and suitable for ATF+4. Its Canadian made group 4 and approx. 9$ tax in a liter. I had read much about the AT2 mystery fluid and saw that AMsoil multi ATF is now suitable for use. Well that is just a good quality full synthetic ATF, 7cSt fluid. Well what the [censored], lets try it. Did a decent run in and around the area to get the fluid warmed up and circulated and then put it in auto 4wd and did some runs on the grid road to see how the clutch lockup went. Just fine. No clunks, bangs, shuttering, nothing. It engaged great. So who knows long term. Maybe it will blow up and I will curse myself for not using the mystery AT2 fluid. I put Valvoline Transfer case fluid in my step fathers 07 TB. Hasn't died yet! Hey Brian, it�s great you are using a product made by the brothers in Saskatchewan at the Co-op refinery. However if you look at the specs, Sonic ATF SL is a full synthetic equivalent to Dexron III. There are multiuse ATF�s out there but the Co-op Sonic ATF SL is not one of them. 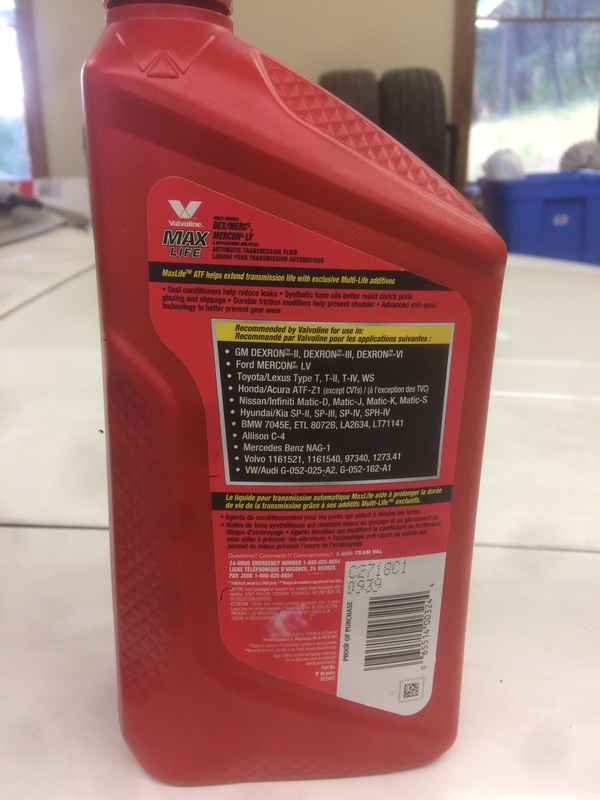 For example, one of the most popular mult-use ATF�s out there is Valvoline Max-Life . I have attached a photo of the back of the bottle. Of all the products it replaces, Auto Trac II is not one of them. Instead Valvoline makes a dedicated transfer case fluid that lists Autotrac II on the bottle. My understanding is that Auto Trac II has a different coefficient of friction than normal Dexron III. Sooooo, it may be true that your transfer case did not explode, but is it still going to be working well in another 80,000 km. For $18 you could have the correct stuff in there. Just sayin�. Yep, and the bottle lists Auto Trac II as one of the products it replaces. I didn't know the Co-op refinery in Regina had a lube plant. Much appreciated and yes it would have been extremely easy for me to get the proper fluid but I want to play around with it somewhat.... The point I was really looking at was this: Dexron III, which was and is still used in transfer cases, is as far as I know mineral based, thicker viscosity fluid. The AT2, which I am not sure if it is mineral or synthetic was looking for a slipperier/friction modified fluid to behave different with the clutch packs. You get Amsoil (I hack on them lots) which claim their multi vehicle ATF is suitable for use for AT2. They run a quality, group 3/4 fluid, which is quite suitable for many transmissions variety of clutch packs. What makes the clutch pack in the AT2 special? No one has yet to answer the question. I read a lot on this and never found anything fact based so next best method is to jump off the diving board and see if I can swim. I don't recall what viscosity AT2 fluid is but the Amsoil equivalent is around that 7cSt, as is the ATF SL. I am being less moved by viscosity limits these days. Side note, look at PetroCan Duradrive. It claims suitable for use with AT2. Its a 7cSt multi vehicle synthetic fluid. They claim suitable for use with a variety of LV fluids as well and have a disclaimer that you might not see the fuel economy savings as a LV fluid but with testing it works just fine. Also suitable for use does not scare me, both PetroCan and Co-op can and do make licenced fluids. I chose the ATF SL, not only because I had some handy but because being a group 4 it has inherent flow properties that group 2 oils do not. I used it with great success in my 545RFE while towing. The transmission shifted great up until the point we sold it. I have PC's Dura-Drive in 2013 1500 SLT 5.3, 2011 SLE 6.6 TCs and soon to be 2018 3500 6.6 High Country. Also PC's 80W140 in ther diffs as I run out of 75W90. Edit; PC now has a low vis duradrive too. Last edited by userfriendly; 08/17/18 12:23 PM. Nice find on the LV Duradrive!! I Emailed them to confirm whether it�s their plant or a seperate company. They advertise Sonic products are blended in Saskatchewan. Stay tuned. Thanks for the update, always wondered about their production.